The Hungarian Digital Archive of Pictures is developed by the Department of E-library Services of the National Széchényi Library. In 1994 we started the Hungarian Electronic Library project with the aim to collect, archive, catalogue and make available the Hungary-related digital documents in the fields of culture, education and academic research. 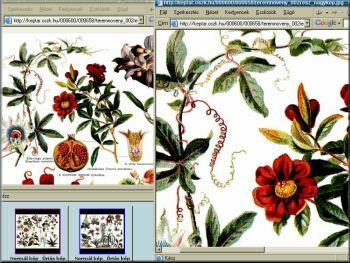 The first outcome of this enterprise was the collection of monographic materials: mek.oszk.hu, the second one was the archive and database of the electronic periodicals: epa.oszk.hu, and the third service is this site: keptar.oszk.hu, a collection of digital images. This archive of pictures has been started in 2007, with the support of the Association for the Hungarian Electronic Library and the Council of Hungarian Internet Providers. The Digital Archive of Pictures collects image files from different sources. First of all we catalogue selected images (usually in better quality) of the illustrated publications in the MEK or EPA collections, so these pictures can be searched and referred individually. Secondly we collect, describe and preserve pictures from other web-sites (e.g. photo sharing sites) and from CD-ROM or DVD publications, if they are comply with the aim of the Digital Archive of Pictures and if we can get permission from their creator, owner or publisher. Such offers can be send to the addresses listed on our "Contact" page. 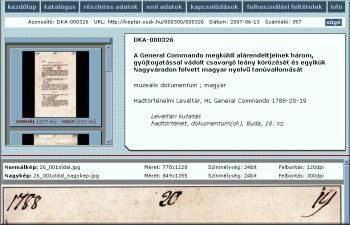 There are more information about the Archive under "Irattár" menu item. Still images, animations and videos are all welcome into this archive. One document can be consisted of several parts (e.g. 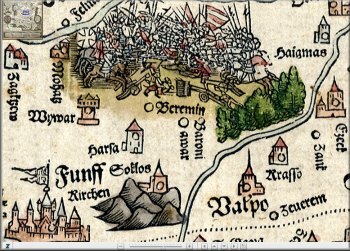 series of slides, or a map cut into different pieces), and sometimes we offer alternative formats, too (e.g. a JPG and a lossless TIFF version). There is at least one "thumbnail" picture (150x150 pixel) for every document, and - in the case of still images - a max. 770 pixel wide "normal sized" picture and often a better "large size" version is also available. The freely available resolution and file format is determined by the owner/publisher of the image, so you have to contact her/him if you need a better version or if you want permission to reuse or republish the image. If the contact address of the responsible person or institution is not shown among the detailed metadata of the document, please write an e-mail to our general dka-info@mek.oszk.hu mailbox. Various browsing and searching facilities help you to find relevant images. If you click on the number of the documents, you will get a full list arranged by the record numbers. On the Hungarian homepage there are menu items with similar lists sorted by the date of acquisition, by popularity or by the name of the creator and the title of the document. By clicking on one of the five main topic buttons on the left side you can browse the collection by subject, and these searches can be transmitted to the MEK and EPA collections as well. There is a quick search form on the right side, where you may type a few words or characters truncated with asterisks. (You have to type Hungarian keywords into the "subject" field!) There is an other input form for searching in almost all (nearly a hundred) data fields. The collection has been divided into several subsets, these are searchable separately under the "Gyűjtemények" menu item. Our aim to create a well-searchable collection of diverse and high-resolution images and other visual documents. In the future we will install such special features into this web-site as interactive zooming of very large images (e.g. atlases), playing music scores by the computer, or automatic slideshows. There will be an RSS feed to follow the newly catalogued items without visiting the homepage of the Digital Archive. An other technical feature that you can download the image files via anonymous FTP from the numbered directories under the ftp://mek.oszk.hu/pub/dka address. The project news are published under the "Hírek" button on the Hungarian homepage. You can find some help to get acquainted with the user interface - esp. with the search functions - by clicking on the "súgó" or "help" buttons. Your feedback is welcome into our guestbook under the "Vendégkönyv" menu, and if you have questions, please send them to the dka-info@mek.oszk.hu mailbox.